George Harrison once famously called Ravi Shankar the Godfather of world music and credited him with almost singlehandedly changing the way we listen. Whether or not you choose to take exception to this statement, it’s nevertheless fair to assert that most people in the west had never heard anything like Indian classical music before the Beatles introduced it to the world at large in the mid sixties. 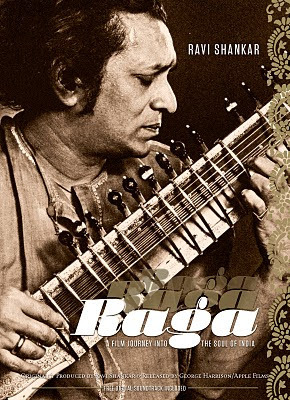 ‘Raga’, a film originally released in 1971 examines the fallout from this cultural encounter as an increasingly frustrated and bemused Ravi Shankar attempts to come to terms with the huge though often shallow and unschooled audiences who come to hear him play. When I met Ravi Shankar after a concert last year in Vancouver, he graciously conceded that he believes western audiences have finally caught up with his music, and that they have learned to appreciate it now without the accompanying ‘cocktail of hashish, Kama Sutra and poor behaviour’ that made him wary of his ever increasing popularity when he first began playing outside of India. In one particularly powerful scene from ‘Raga’, the camera captures Shankar trying to speak with his audience, but his voice has been muted as thousands of stoned hippies, dance, talk, and appear to do everything except fully experience his music. As the camera follows Shankar on a trip to revisit his guru Baba Allaudin Khan in India, the sitarist admits that even in his own country so much had changed by the end of the nineteen sixties that the rigorous training he received was impossible to duplicate given the demands of the modern world. As a young student, Shankar was not even allowed to touch his instrument for several years until he had mastered the theory behind its sound, an admission that is poignantly counterpointed by Shankar’s dismay with young American students who want to learn to play a full raga after only a month’s instruction. Of course this is a situation that has continued to decline as Shankar told me a story last year about students who now learn to play the sitar by watching videos on YouTube. As interesting and important as Shankar’s perspective is, it’s important to put all of these sociological concerns aside and watch ‘Raga’ for what it offers – a document of Ravi Shankar at the absolute peak of his powers. From my perspective even though Shankar complains of the almost mindless adulation that greeted his music, his initial popularity in the sixties – at the very least – provided the impetus for the marvellous footage captured here from Monterey Pop and many other live performances. However undeveloped his audience may have been at that time, Shankar never pandered to the crowd or ‘dumbed down’ his sound for anyone and the music captured here is delicate, ferocious, intricate and breathtaking. 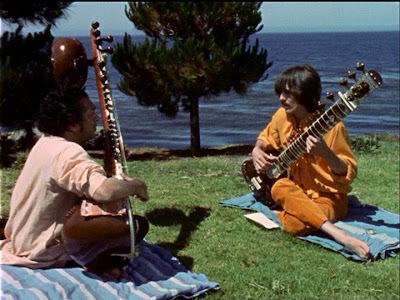 For Beatles fans, there is some wonderful footage of Shankar patiently trying to explain the rudiments of the sitar to a very young George Harrison. It’s easy to understand how he took solace in the guitarist’s devotion as Harrison struggles to grasp the huge tonal palette the sitar offers. Whatever he lacked in finesse and formal training, he more than made up for in looseness and enthusiasm. This is especially true when compared with the rather stiff and formal footage of Shankar trying to find a groove with Yehudi Menuhin, the renowned classical violinist. There are many reasons to recommend seeing ‘Raga.’ It’s possible to enjoy it simply as a cultural document. The footage of hippies twirling obliviously to Shankar’s music is priceless and recalls a more innocent time in our recent history. On a deeper level, ‘Raga’ captures a world that is disappearing, and anyone who’s visited India recently knows that the country gloriously captured in this footage from 1970 has evolved more than we yet understand. More than anything, ‘Raga’ is a passionate journal of a committed soul who overcame huge physical and cultural obstacles to bring his ancient art form to the west. One only hopes that today Ravi Shankar is able to appreciate and enjoy the fruits of his decades of labour and understand that the sophisticated appreciation of Indian classical music that has evolved over time is largely due to his commitment and hard work.